Aquatic foods have become a popular part of diet in many countries. Due to the awareness on the health attributes of aquatic foods, many health conscious people in affluent countries are turning to aquatic food products as an alternative to other meat products. Therefore, ensuring the quality of aquatic food is a major concern to the food business operators and the public health authorities. Thus, the need for quality assurance is quite significant, specifically in view of the increasing rate of food borne illness associated with microbes, chemical contaminants, pollutants, etc. International standard organizations are enforcing new guidelines and recommendations to test the aquatic food products for their safety with minimum residual levels. The awareness on the arising quality issues becomes therefore essential to meet the international demands as well to ensure the national security. With this background, the Department of Fish Quality Assurance and Management was established in the year 2012. The Government of Tamil Nadu through its G.O No. 312, dated 26.11.2013 has sanctioned the staff strength required for the operation of DFQAM with 6 teaching staff (Prof– 1; Associate Prof – 2; Assistant Prof – 3) and 5 non-teaching staff. At present, DFQAM offers three B. F.Sc. courses .The M.F.Sc (Fish Quality Assurance and Management-FQM) was started in the year 2012-13 and the Ph.D. (FQM) in the year 2014-15. 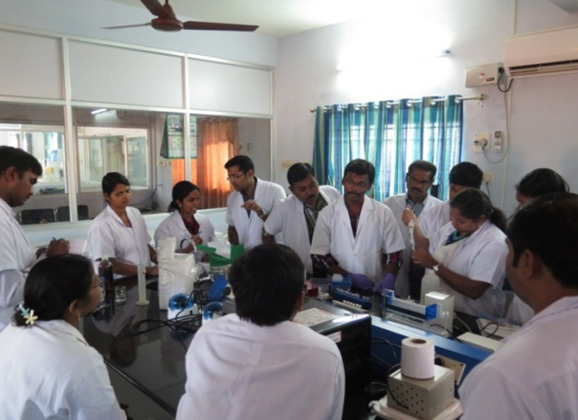 The Department has laboratories equipped with state of the art analytical testing equipments. Nine externally funded projects focusing on seafood quality have been successfully completed and at present one externally funded project and one University self financing scheme are in operation. The TNJFU Referral Laboratory on Fish Quality Monitoring and Certification of the Department is being involved in quality analysis of samples received from fish processing industries and generating income for the University in the self-financing mode. Apart from this, several technologies have been developed and disseminated by this Department. The DFQAM functions with the motto of “QUALITY, SAFETY AND AUTHENTICITY”. To offer M.F.Sc and Ph.D. degree programme in Fish Quality Assurance and Management. To offer courses pertaining to fish quality and safety to the B.F.Sc. degree students. To carry out research projects in the areas of fish quality and safety. To guide the PG students in the field of fish quality assurance. To impart training to the fish quality control technologists, fish processors, fisher folk, SHGs, etc. on fish quality and safety management programmes. To serve as fish quality monitoring and certification centre for testing the quality of fish and fish products and issuing quality certificates to the fish entrepreneurs. Fish Quality Assurance and Management is an important area under the fish processing sector to ensure supply of quality and safe fish to the consumers. The DFQAM offers courses for B.F.Sc, M.F.Sc and Ph.D. degree programmes. The three courses offered for B.F.Sc. include Food Chemistry and Fish in Nutrition, Microbiology of Fish and Fishery Products and Fish Quality Assurance. The curriculum of the course on Food Chemistry and Fish in Nutrition is designed in such a way that it covers the aspects such as composition of fish, its proteins, lipids, nutritive value, aspects of nutritional labeling and protein quality tests. The course on Microbiology of Fish and Fishery Products deals with role and significance of microorganisms in foods, parameters affecting microbial growth, microorganisms associated with raw and processed aquatic foods, food-borne pathogens, indicator organisms, viruses, parasites, fungus and their toxins, encapsulation and detection methods. The course on Fish Quality Assurance covers all aspects of hazards, quality indices, seafood safety, and quality standards for seafood, hygiene and sanitation. Aquatic food being a highly perishable commodity undergoes rapid spoilage and deterioration leading to food quality and safety concerns. The quality and safety issues associated with aquatic food products are ever growing due to high industrialization, aquafarming practices, urbanization and globalization of standards. Research undertaken by the quality control unit of the Department of Fish Processing Technology is very much appropriate to the current issues and problems in fish processing industry. A total of 11 research projects are obtained from various external funding agencies like ICAR, DBT, CSIR, DST and NADP to a tune of Rs. 5,35,71,800 since its inception as a small quality control unit in 1996. This department provides platform for the scientists across the country to undertake professional attachment training on food safety, as part of collaborative or academic or industrial scientists research. Important research areas are safety problems associated with chemical hazards viz., heavy metal, antibiotics and pesticides residues, authentication of processed commercially important fish species such as shrimp, crab, snapper, grouper, tuna, seerfish and sardines by molecular methods, collagen peptides to treat osteoporosis, biogenic amines in fishery products, histamine toxicity problems in the different processed fish products, dry ice fresh fish preservation: microabial assay for antibiotic residue analysis, food spices as preservatives for shelf life extension of processed fish, rapid detection of bacterial pathogens by multiplex PCR particularly Salmonella, Vibrio cholerae, Escherichia coli, Staphylococcus aureus, Aeromonas hydrophila, m-RNA based RT-PCR assay for the detection of live bacterial pathogens, effect of heat processing on the health beneficial omega-3 fatty acids and so on. Besides this, basic research is also being carried out on the nutraceutical properties of the bioactive molecules derived from aquatic origin such as collagen, chitosan, gelatin, fucoidan, peptides and chitooligosaccharides. The DFQAM is undertaking extension activities for the benefit of the fish processers, fish quality control technologists, scientists and researchers of fish post harvest technologists, self help groups (SHGs) by conducting special need-based training programmes on fish quality analysis, microbial quality testing, quality testing of dry fish products, quality testing of fish meal and oil, waste utilization, etc. Under the Niche Area of Excellence, three specialised training programmes were conducted for the benefit of Researchers, Assistant Professors and Scientists working in SAU, ICAR Institutions, Universities and other Educational Institutions as part of the capacity building programmes. Two special outreach programmes were also organized by the quality control unit. A International conference on “Emerging issues in Quality and Safety of Fish and Shellfish” was organized in 2016, in which more than 10 invited speakers from US, Australia, Thailand and Sri Lanka and 180 participants from different parts of the world attended and presented their research findings. 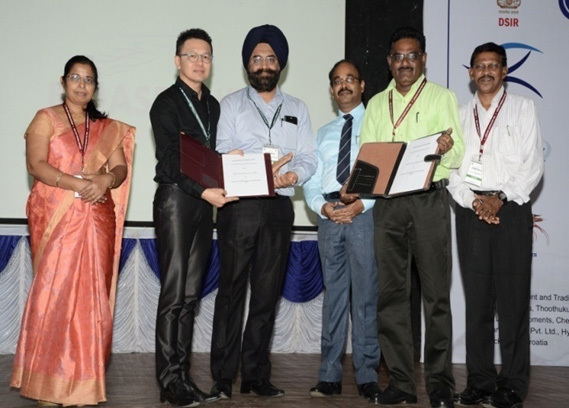 Earlier, a National Seminar on “Emerging issues in Fish Quality and Safety of Fish and Shellfish” was organized in 2008, in which more than 250 participants from different parts of India attended and presented their research findings. An ICAR sponsored Winter School on “Seafood safety – currents issues and problems” was conducted in 2006 for the benefit of 25 participants from all over India. Under the self financing scheme, samples received from seafood industries, fish meal plants, universities, researchers are being analyzed for various biochemical, microbiological, molecular and organoleptic qualities on charge basis as approved by the University. The income generated is being utilized in the self-financing mode successfully for the past five years. A separate building for the Fish Quality Monitoring and Certification Centre, with a floor area of 1752 sqft, was first constructed in the FC&RI main campus and inaugurated by the Hon’ble Chief Minister of Tamil Nadu, Dr. J. Jayalalithaa on 11.08.2012. Consequent to the approval by the Board of Management for the formation of a separate department in 2012, this building was converted as the Department of Fish Quality Assurance and Management (DFQAM). The first floor of the DFQAM was constructed in 2013 as a “Chemical Residue Monitoring Laboratory” with the funding support from NADP. Under the ICAR- Niche Area of Excellence on “ Fish safety and Quality Assurance, an annexure building was constructed with a floor area of 2000 sqft to house the analytical instruments like ICP-MS, GC-MS, etc.at a cost of 40 lakh and another Rs. 10 lakh for interior works. There is a smart training hall with a capacity to seat 50 persons facilitating to conduct of training and seminars. The department in compartmentalized to accommodate Microbiology lab, Biochemistry lab, Food Biotechnology lab and Instrumentation room. 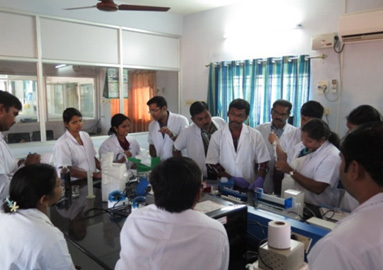 The laboratories are provided with island tables for placing the chemicals, reagents, records, etc with sufficient work space for conducting research work and practical classes. There are two staff rooms, a conference hall, an office room, reception area, visitor chairs, work benches for research scholars/ students, a record room and four rest rooms. The DFQAM has got state-of-art facilities for analysis of various analyses. The most important and modern instruments available in the different laboratories are LC-MS/MS system (Waters UPLC + ABSciex Mass Analyzer), UPLC system (Waters UPLC), Capillary Gas Chromatograph (Perkin Elmer), GC- MS (Thermo), ICP-MS (Thermo) , Semi-automatic Column Chromatograph (GE Health Care), UV-Vis Spectrophotometer (Jasco), Spectofluorometer (ELICO), Universal Testing Machine (Lyold), Lyophilizer (Christ), Gas Analyser (Dansensor), Water activity meter (Aqualab), Real time PCR (ABI), Gradient PCR (Eppendorf), Gel documentation (Alfalaval), Microfuge (Eppendorf), Refrigerated Centrifuge (Hettich, Eppendorf), High Precision Balance (Sartorius), Kelplus apparatus (Pelican), Socplus apparatus (Pelican), Fiberplus apparatus (Pelican), Biophotometer (Eppendorf), Water Purification System (Sartorius), Biosafety Cabinet (Clear Air), Vacuum packaging machine, Flake Ice machine, Spray Drier, Gelatin Extraction Vessel, Overpressure retort and Horizontal sterilizer. Since inception of this department as a small unit, twelve students have completed their M.F.Sc degree programmes in the discipline of Fish Processing Technology/ Fisheries Biotechnology but majoring in the area of Fish Quality Assurance. The first batch of M.F.Sc (FQM) students passed out during June 2014. All the students who have passed out of this Unit/ Department are placed in responsible and high positions in public/ private sectors and also pursuing higher studies in world renowned Universities. To specify few, Mr. Devivaraprasad Reddy has received the best M.F.Sc Thesis Award and Young Scientist Award in 2011 for his research contribution. 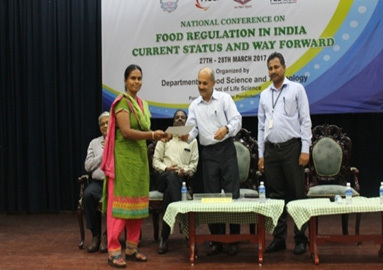 Dr. R. Jeya Shakila and her team received the JFST Best Paper Award for the year 2013 for their research paper on fish collagen published in the Journal of Food Science and Technology (NAAS rating : 7.8). Mr. Muralidharan has also been awarded with International Fellowship by the ICAR for pursuing his Ph.D. studies in Thailand. 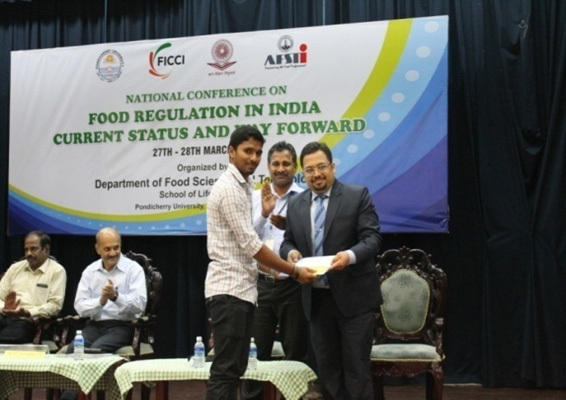 Mr. U. Manimaran has won the Award in the First Students Research Convention on Innovations in Fisheries held at CIFE, Mumbai in 2013. 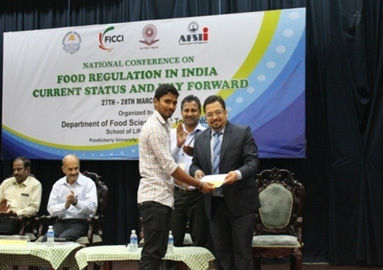 Mr. B. Sivaraman, Ph.D. Scholar attended the “2014 Innovative Food Processing Technology Workshop” held in the Department of Food Science, National Pingtung University of Science and Technology, Taiwan in 2014. The staff and students of this Department made several oral and poster presentations in the International Conference on EIQASFISH, Chennai. Dr. R. Jeya Shakila won the best oral presentation award and Mr. B. Sivaraman and Ms. T. Surya won best poster presentation awards. 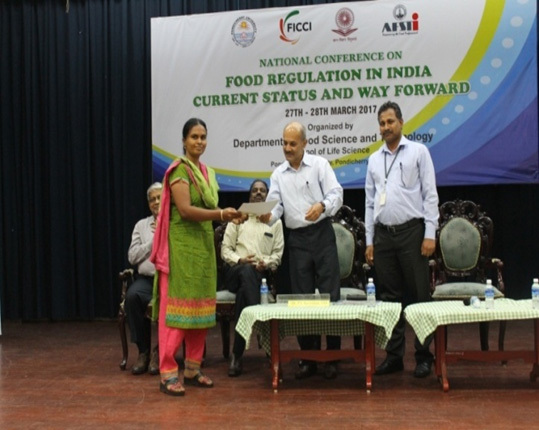 In the National Conference on “Food Regulations in India-Current Status and Way Forward” held at Pondicherry University, Pondicherry during March 2017, Mrs. R. Shalini, Assistant Professor won the second prize in the oral presentation and to M.F.Sc students Mr. U. Arisekar, and Ms. Lidya Wilwet, M.F.Sc. students in this department received second and third prizes respectively in poster presentation. Student Ms. Lidya Wilwet participated in the Innovation Festival (2017), held at Tirunelveli. Molecular method for authentication of processed shrimps to prevent economic fraud. The scheme on Quality Analysis of Fish Samples is one of the successfully running self financing schemes of the University generating income consistently. This Department has been identified by the ICAR to serve as Niche Area of Excellence in “Fish Safety and Quality Assurance” in India by providing a huge funding support of Rs. 305 lakh, which shows the zeal and hard work of the staff behind this development. The DFQAM focuses primarily on offering exclusive M.F.Sc (FQM) and Ph.D. (FQM) degree programmes for the students to excel in all facets of the Fish Quality Assurance and Management, as this programme is the first of its kind in India. The DFQAM aspires to enroll NRI students in the coming years to this unique degree programmes. Our immediate focus is to obtain the NABL accreditation according to ISO 17025 for the laboratory to act as a nodal centre for testing the quality of aquatic food products meant for export and domestic markets. Apart from this, the DFQAM conducts need based trainings to the fisheries professionals, fisherfolk and students. The self–financing scheme will be further expanded in a big way to operate as a “24x7 Fish Quality Testing Center”. It helps to provide employment to the quality technicians, to earn income for the University, and to develop into a separate Directorate for Fish Quality Monitoring and Certification. Jeevithan E, Christelle S, Jose EMS, Yves H, Shujan W, Keolebogile SCMM, Ruiheua G, Chunxiao W, Jeya Shakila R, Jow MR, Bin B and Wenhui., 2018. Cross talk between primary osteocytes and bone marrow macrophages for osteoclastogenesis upon collagen treatment. Nature Scientific Reports., DOI 10.1038/ 841598-018-23532-x(NAAS rating: 20). Surya T, Jeyasekaran G, Jeya Shakila R, Asha Hema Malini N, Palanikumar M, Alamelu V., 2018. Formulation of biogenic amines in delayed salt-curd whole and gutted Indian oil sardine (Sardinella longiceps). Journal of Aquatic Food Product Technology., 27(3): 394-404 (8.32). Sivaraman B, Jeyasekaran G, Jeya Shakila R, Alamelu V, Lidiya Wilwet, Aanand,S., 2018. PCR-RFLP for authentication of different species of processed snappers using mitochondrial D-loop region by single enzyme. Food Control., 90:58-65 (9.50). Reshma Ramesh, R. Jeya Shakila, R. Sivaraman, P. Ganesan and P. Velayutham., 2018. Optimization of the gelatinization conditions to improve the expansion and crispiness of fish crackers using RSM. LWT Food Science and Technology., 89:248-254 (7.26). Lidiya Wilwet, Jeyasekaran G, Jeya Shakila R, Sivaraman B. and Padmavathy, P. 2017. A single enzyme PCR-RFLP protocol targeting 16S rRNA/tRNAval region to authenticate four commercially important shrimp species in India. Food Chemistry on 18.06.2017239369-376. Shalini R, Jeya Shakila R, Jeyasekaran G. and M. Palanikumar. 2017. Effect of Frying in Different Cooking Oils on Omega 3 Fatty Acids of Goldstripe Sardinella. Fishery Technology. 54 (176-182). Jeevithan E, Jingyi Z, Bin B, Krishna moorthy P, Shujun W, Wu WH and Jeya Shakila R., 2016. Rheological, biocompatibility and osteogenesis assessment of fish collagen scaffold for bone tissue engineering. International Journal of Biological Macromolecules., 91: 51-59 (8.86). Sivaraman B, Jeya Shakila R, Jeyasekaran G, Sukumar D, Manimaran U, and Sumathi R., 2016. Antioxidant Activities of Squid Protein Hydrolysates Prepared with Papain Using Response Surface Methodology. Food Sci. Biotechnology., 25: 665-672 (6.9). Jeya Shakila R, Parthiban F, Jeyasekaran G and Shalini R., 2016. Antioxidative properties of squid protein hydrolysates prepared using seerfish visceral enzymes in comparison with commercial enzymes. Journal of Aquatic Food Product Technology DOI: 10.1080/ 10498850. 2015. 1004499 (6.69). Jeya Shakila R, Varatharajakumar A, Jeevithan E, Jeyasekaran G and Sukumar D., 2016. Suitability of antimicrobial grouper bone gelatin films as edible coatings for vacuum packaged fish steaks. Journal of Aquatic Food Product Technology., 25: 724-734 (6.69). Manimaran U, Jeya Shakila R, Shalini R, Sivaraman B, Sumathi G, Selvaganapathi R and Jeyasekaran G., 2016. Effect of additives in the shelf-life extension of chilled and frozen stored Indian octopus (Cistopus indicus). Journal of Food Science and Technology., 53: 1348- 1354 (8.02). Shalini, R., Shalika, R.J. and Alamelu, V. 2016. Impact of microwave cooking on the health beneficial omega 3 fatty acids of sardines. International Journal of Science, Environmentand Technology. 5 (6):4512 – 4517. Sumathi G, Jeyasekaran G, Jeya Shakila R, Sivaraman B, Manimaran U, Sukumar D and Arunkumar G., 2015. Molecular identification of grouper species using PCR-RFLP technique. Journal of Food Control., 51: 300 – 306 (8.76). Shalini R, Jeya Shakila R, Jeyasekaran G and Jeevithan E., 2015. Sensory, biochemical and bacteriological properties of octopus Cistopus indicus stored in ice. Journal of Food Science and Technology., 52: 6763- 6769 (8.02). Jeya Shakila R, Edwin Raj B and Felix N., 2015. Sensory, biochemical and microbial qualities of canned farmed cobia processed with Indian spice masala mix. Journal of Aquatic Food Product Technology., 24: 330- 339 (7.2). Jeevithan E, Jeya Shakila R, Varatharajakumar A, Jeyasekaran G and Sukumar D., 2013. Physico-functional and mechanical properties of chitosan and calcium salts incorporated fish gelatin scaffolds. International Journal of Biological Macromolecules., 60: 262-267 (8.86). Muralidharan N, Jeya Shakila R, Sukumar D and Jeyasekaran G., 2013. Skin, bone and muscle collagen extraction from the trash fish, leather Jacket (Odonus niger) and their characterization. Journal of Food Science and Technology., 50:1106-1113 (8.20). Jeyasekaran G, Jeya Shakila R and Sukumar D., 2012. Microbiological quality of Cuttlefish (Sepia pharaonis) fillets stored in dry and wet ice. Food Science and Technology International., 18:455-464 (7.22). Jeya Shakila R, Jeevithan E, Varatharajakumar A, Jeyasekaran G and Sukumar D., 2012. Comparison of the properties of multi-composite fish gelatin films with that of mammalian gelatin films. Food Chemistry.,135:2260-2267 (9.39).